When Apple boss Tim Cook revealed the third-generation Apple Watch in September 2017, one slide from his presentation stood out more than most. It claimed Apple was now the world’s number one watch manufacturer. Not smartwatch, but watch. With typical smugness, Apple showed how its Watch sat above Rolex, Fossil, Omega and Cartier. Five months on, sales data from IDC claimed the Apple Watch had outsold the entire Swiss watch industry in the fourth quarter of 2017. Apple’s first wearable had given the Swiss a bloody nose. Now, though, Switzerland is fighting back. Some are tackling Apple head-on with smartwatches of their own, while others are dipping a toe into the water with hybrid watches that combine traditional design with Bluetooth, accelerometers and apps. This is an industry that was rocked by the quartz crisis of the 1970s – a decade where the industry was almost wiped out due to soaring demand for cheaper, more accurate Japanese watches. Eager to not repeat past mistakes, the Swiss are (in some quarters, at least) already embracing modern technology to stay relevant. Here, T3 looks at what watchmakers from Switzerland – and elsewhere – are doing to fight back against the rise of Apple and the smartwatch. Tag Heuer was the first Swiss watch company to react to Apple, Samsung and Google, when it launched the Connected in 2015. Boasting an Intel processor and Google’s Android Wear (now Wear OS), the Tag Heuer Connected was chunky, cost over £1,000, and missed out on key smartwatch features such as a heart rate monitor. But that didn’t matter; Switzerland was in the game, and leading its efforts was Tag boss Jean-Claude Biver, a giant of the Swiss watch industry and key to its survival during the quartz crisis. The original Connected gave way to the Connected Modular and the newest instalment, the smaller Connected Modular 41, which is arguably one of the best Wear OS devices on sale today. It might not be selling in numbers to bother Apple (around 70,000 as of February 2018), but it was a strong move by Tag, and went to show that at least some parts of Switzerland are keen to embrace the touchscreen. In 2017, Montblanc joined the Swiss smartwatch party with the Summit, a Wear OS device with a large 46mm stainless steel case, leather strap, and a circa £800 price tag. Like the Tag Heuer, this watch has all the usual Wear OS trimmings, but puts its own luxurious stamp on it by including some Montblanc-designed watch faces. Where Apple and other smartwatch makers employ their own unique strap attachments, Montblanc understands that luxury watch buyers want more than a handful of factory-made options, so the Summit has regular 22mm lugs for fitting any regular watch strap. New for 2018, the Hybrid Manufacturer by Frederique Constant blends a Swiss-made self-winding mechanism with a smart module containing Bluetooth, a rechargeable battery and an accelerometer. The result is a classically-designed wristwatch with the ability to track steps, exercise and sleep. A neat trick of the Hybrid Manufacturer is how it can provide an overview of the watch’s mechanical health – the rate, amplitude and beat error, specifically – via the companion smartphone app, and let you know when it’s due a service. 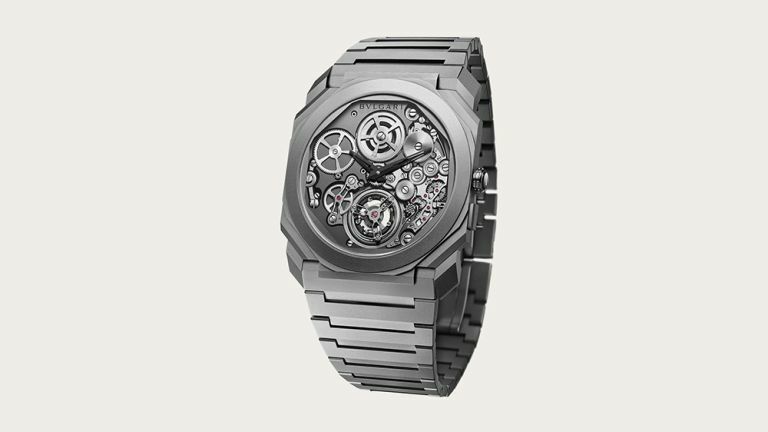 One for the watch nerds for sure, but a neat example of how Geneva and Silicon Valley can play nicely together. With prices starting at £3,000, this is still very much a luxury Swiss watch rather than a luxury smartwatch, but it is fascinating to see how a centuries-old industry is now willing to adopt and experiment with change. If you aren’t ready for the mechanism of your watch to become smart (even if half is still self-winding), then the E-Strap offers a practical alternative. Realising the smartness of a hybrid watch doesn’t have to be located inside the watch case, Frederique Constant fits this strap with an accelerometer, Bluetooth chip and battery. This means it can track your daily steps, exercise and sleep while being fitted to any watch that accepts a regular 22mm strap. Where some Swiss brands are adopting smartwatch tech to counter their new rivals, others are sticking to what they know: incredible engineering. In the case of Bulgari, this isn’t just a watchmaker sticking to what it knows, but excelling at it until records are broken. A recent achievement of Bulgari is the Octo Finissimo Tourbillon Automatic, which earlier this year earned the titles of world’s thinnest automatic watch, and the world’s thinnest watch with a tourbillon movement – the latter of which had stood since 1986. Sure, cramming a processor, Wi-Fi, Bluetooth, 4G, GPS and storage into a smartwatch is impressive. But these are just chips soldered to a circuit board inside a smartwatch that is 10mm thick at best. The movement of this Bulgari watch is 1.95mm thick and it sits inside a 3.95mm case, yet it still offers a 52-hour power reserve. This is technology, just not as Silicon Valley knows it. Using technology to make a regular watch more accurate and functional is an approach shared by Belgium-based Ressence and its Type 2 e-Crown concept. Giving the concept some tech kudos is the fact that Tony Fadell – one of the grandfathers of the original iPod – helped Ressence with the design. Only a prototype for now, the Type 2 e-Crown shows what can be done by incorporating technology to improve a timekeeper, rather than to track your every move and alert you to WhatsApp messages. Thanks to a Bluetooth connection to your smartphone, the watch sets its time automatically, adjusts for daylight saving hours and switches time zones based on your location. To delight mechanical watch fans, the Type 2 e-Crown enables the wearer to decide how time is kept. You can leave it on automatic, keeping things accurate to the second, or you can pick from semi-automatic or fully manual modes. Interestingly, the self-winding mechanism charges up the Bluetooth module too, so there’s no charging cable to worry about. The watch also draws power from ambient light using a tiny solar panel hidden behind shutters on the watch face that open when the battery gets low.